Showcase was abandoned. Chestshop needed a display, with signs whose order you could never remember. SCS has too many commands. I'm yet to find someone who uses essentials shops. Don't get me wrong though, they're all awesome plugins each in a few ways. So, I set out to write this. QuickShop. 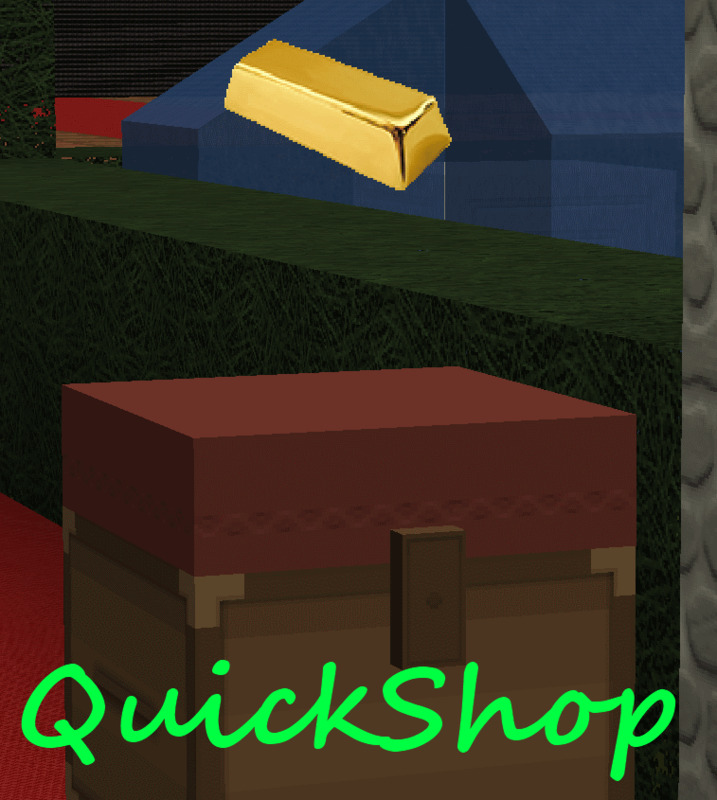 QuickShop is a shop plugin, that allows players to sell items from a chest with no commands. It allows players to purchase any number of items easily. In fact, this plugin doesn't even have any commands that a player would ever need! Checks a player can open a chest before letting them create a shop! Stock the shop accordingly, if necessary. See it in action: http://maxgamer.org or play.maxgamer.org:25571 and /warp market! /qs unlimited - Makes the shop you're looking at become unlimited. /qs setowner <player> - Changes shop owner to <player>. /qs clean - Removes any existing shop that has 0 stock. /qs find <item> - Use to find the nearest shop that begins with <item> - E.g. '/qs find dia' will find the nearest diamond shop. quickshop.create.double - Required to make doublechest shops. quickshop.create.changeprice - Required to use /qs price (Ability to change the price of a shop without destroying it. This may allow for some scammers to quickly change the price while someone is buying. quickshop.clean - Permission to purge any shops that have 0 stock. Checkout the config over here. Try out this plugin http://dev.bukkit.org/server-mods/quickshop-towny-interop/ to stop players creating shops outside of Towny shop plots! Hi, I'm an 19 year old University student studying Software Engineering. I spend my time writing code that I receive practically no reward for other than people asking questions I've answered a hundred times before. I know server Admin's and Owners aren't the richest of people - But if you're feeling particularly generous, I always appreciate any amount for the time and patience I put into coding Bukkit plugins. Does not work with latest version of bukkit (dev) Quickshop does not load. 1:50:25 PM [SEVERE] java.sql.BatchUpdateException: batch entry 1: [SQLITE_ERROR] SQL error or missing database (no such column: item) 1:50:25 PM [SEVERE] at org.sqlite.Stmt.executeBatch(Stmt.java:226) 1:50:25 PM [SEVERE] at org.maxgamer.QuickShop.Database.DatabaseWatcher.run(DatabaseWatcher.java:41) 1:50:25 PM [SEVERE] at org.bukkit.craftbukkit.v1_4_6.scheduler.CraftTask.run(CraftTask.java:53) 1:50:25 PM [SEVERE] at org.bukkit.craftbukkit.v1_4_6.scheduler.CraftScheduler.mainThreadHeartbeat(CraftScheduler.java:345) 1:50:25 PM [SEVERE] at net.minecraft.server.v1_4_6.MinecraftServer.r(MinecraftServer.java:530) 1:50:25 PM [SEVERE] at net.minecraft.server.v1_4_6.DedicatedServer.r(DedicatedServer.java:224) 1:50:25 PM [SEVERE] at net.minecraft.server.v1_4_6.MinecraftServer.q(MinecraftServer.java:494) 1:50:25 PM [SEVERE] at net.minecraft.server.v1_4_6.MinecraftServer.run(MinecraftServer.java:427) 1:50:25 PM [SEVERE] at net.minecraft.server.v1_4_6.ThreadServerApplication.run(SourceFile:849) 1:50:25 PM [SEVERE] [QuickShop] Could not update database! Enable sneak-only in the config. Players will have to sneak to create or use a quickshop. Thanks so much nether. Last question! haha. Is there a way to disable the message about what players want to sell everytime they place a chest? Not on 1.4.6... Its pretty simple to update to it. I might put a link for 1.4.6 on dropbox or somewhere in the meantime... tomorrow. I haven't updated bukkit yet but will this work when the dev 1.4.6 build? The new one that you just finished? I'm working on it now... Bukkit made some RETARDED internal changes. Eagerly awaiting the fix for this. Driving us mad. Try downgrade to quickshop 2.7 til you update bukkit..
As for the build, I'm not aware there was one I could select at the time of uploading... Plus the bold dev build only. My goal is to have 3 item frames on each side of the chest, and the sign on the other. I figured this out but thank you. I noticed more than 1/2 are posting this same issue here - which is likely due to your listing the latest as 1.4.5-R0.2 Beta compatible when in fact it is not; it is only dev build compatible. Great job on the plugin btw - I like 2.7 very much and look fwd to running more recent code with item frames once bukkit beta is updated. Can you explain how the item frame config option works / what it does for those of us who arent able to use the newer dev build yet? Does it replace the sign or is it added block above in addition to the chest sign? pls add /qs off and /qs on for people do not use quickshop :) because all time we open a chest we not wanna to create a shop. the Bukkit version i use is "craftbukkit-1.4.5-R0.2"